Brick Town Talk: Grub Fiction - LEGO Town, Architecture, Building Tips, Inspiration Ideas, and more! Quentin Beach, Hawaii - (BTT) With all the burger joints out there, from the well-known fast food chains to the local restaurants with their own signature sandwich, it can be hard to stand out in the crowd. 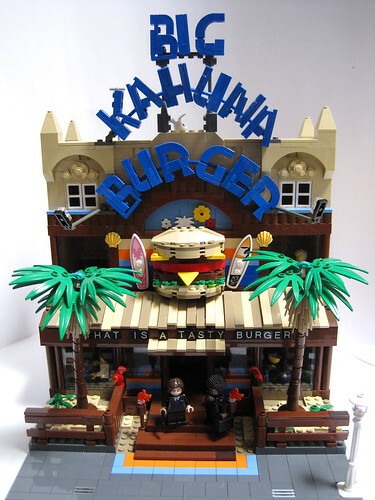 The Hawaiian-themed Big Kahuna Burger might not have the snappiest of slogans, but they sure know how to make a mean patty - it's no surprise that their food is a favorite among the Hollywood elite, especially while on the job.